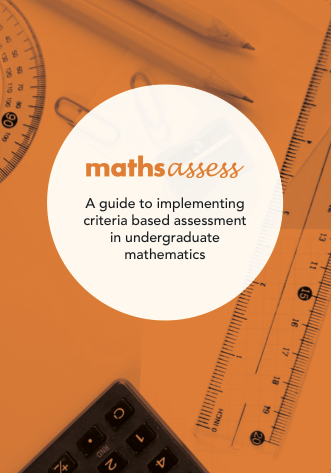 Welcome to mathsassess, a guide to implementing criteria based assessment in undergraduate mathematics. Assessment criteria articulate to students what they are required to do to complete a task successfully or to achieve a particular grade. They signal what students should focus on and hence direct their learning efforts. On the other hand, student work is graded using the established criteria, and so provide certification of students’ levels of achievement to the community at large. Although assessment criteria are widely used in many disciplines, they are not commonly present in the context of undergraduate mathematics. This guide aims to address this gap and support effective mathematics assessment practices in higher education. The mathsassess guide is designed for novice mathematics lecturers as well as more experienced lecturers who are making the transition to criteria based assessment. worked examples illustrating the use of assessment criteria in undergraduate mathematics.